I know! This is one cheeky bad boy! If your eyes have recovered enough to read on, I shall explain why a flash of red has just emblazoned your screen. On Saturday, the Bolton Clandestine Cake Club will turn one. A whole year of baking experimental cakes, meeting new friends and drinking lots of tea. I was never going to make something ordinary for such an occasion now... was I? Now I'm not into decorating, and I am not blessed with the patience of a saint, but I do love a good bundt. I tried to remember what I loved about birthday parties as a child. One of the things that went ping was Cherryade. Oh how I loved the red stuff! If it was red, I was all over it. In later years came the slightly more sophisticated Tizer, but granted I was still only 9. Oh how we shrieked with glee when a dinner lady went to mop up a pool of Cherryade after some cack handed frigger's wayward elbow sent a bottle flying! It had stained the table like a big love heart. It was like marking our territory in the dinner room... and probably did a similar thing to our digestive systems. Fizzy red pop packed with colour and E numbers fuelled many a school trip, roller disco and trek back from the corner shop. The sad truth is that I poured myself a glass whilst making this cake and was horrified to learn that it tastes nothing like I remember. It's like drinking some sort of syrup, and I'm not sugar shy. Fearing for the life of my cake, I tested a slice when it was done. To my delight, the baking process has removed that harsh taste and a delicate cherry scent and taste is left in its place. It was ALIVE! No flux capacitor required - I was back in 1991 wearing ski pants, slouch socks, a shell suit top and furry Ascot trainers. Whether you share my fond memories of Cherryade or not, don't be afraid of trying the recipe. My tribe of tame cake guinea pigs gave it a resounding thumbs up! I thought a bright red cake recipe would be useful for anyone planning a spot of Red Nose Day baking too. Grease and flour a regular sized bundt tin (2.4l, 10 cup, 10 inch). I used my trusty Anniversary tin because I wanted a smooth finish. Soften the butter and vegetable fat together, then cream in the sugar in stages. Beat it on a medium speed for about 5 minutes. We want this cake to be very light. Add the eggs one at a time on a slow setting so it doesn't curdle - if it does, add a table spoon of the flour. It's going to look huge! Mix in the vanilla paste. Measure the Cherryade into a jug. Add a good dollop of red food dye. I find the gels much more reliable than the liquid stuff. Give the whole thing a quick mix for about 10 seconds or until well combined. It no longer looks like a dog's dinner. TIP: You don't want the batter to look blood red. We are suggesting red rather than making a red velvet cake. This just assists the brain on its quest to taste the cherry, whilst keeping flavours quite subtle. Bake at gas 3/160 C for about an hour and 30 minutes. Allow the cake to cool for 10 minutes in the tin before turning out onto a wire rack. Add about 250g of icing sugar to a large jug. Don't bother sifting, it's a waste of time and all you really achieve is lungs full of sugar. Add enough Cherryade to make a thick yet runny icing. Add enough food dye to make a cherry red colour. Pour over the entire cake and leave it to run down naturally. Whilst the icing is drying, pop on some cherry sweets! good lord... i'm blind!... BLIND!!!!!!!!!! Haha! What was really weird was how little food colouring was needed!? You should have seen my kitchen. It was like Dexter forgot to tidy up! I love this, what a great idea! Lovely photos too. Thanks folks! I'm sure it didn't glow in real life... Tastes pretty special though! Wow, definitely grabs your attention. A really fun cake And perfect for Red Nose Day. Wow!! that is the brightest cake I've ever seen. 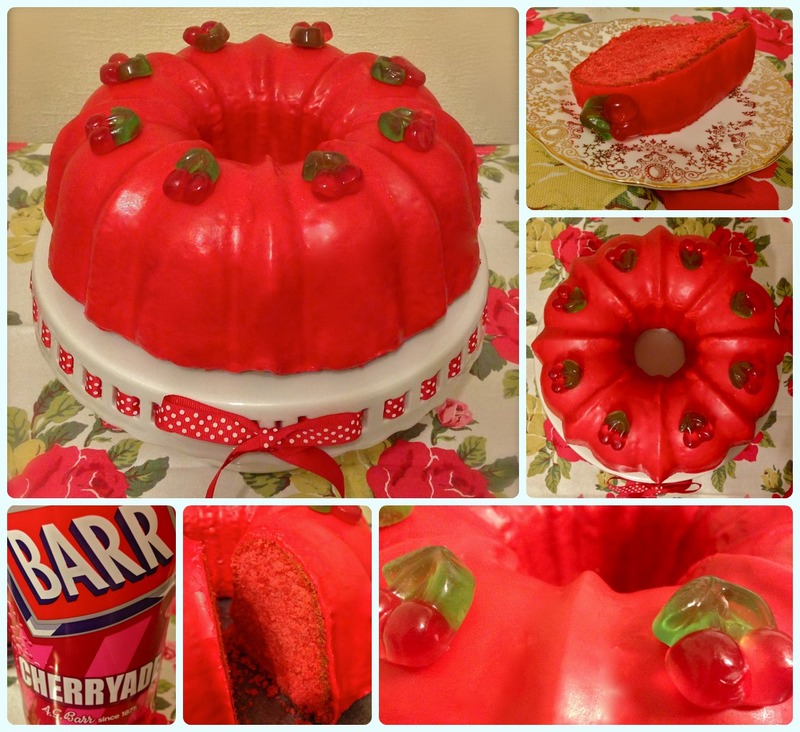 Genius idea to make a cherryade cake, love it! Haha I used to love cherryade back in the day too! I absolutely love how you've decorated it! That vibrant red icing is fantastic and the little cherry haribo's really top it off perfectly! This is amazing! I love bright cakes so much! Wait, hang on. Just going for my shades. Okay! That is an impressively vibrant red Bundt. Holy cow! In the States our bright red, stain your mouth and everything else it touched childhood drink was Cherry Kool-Aid. It came in little packets of concentrated powder and one added piles of sugar and water to make a pitcher full of drink guaranteed to send most children into hyperactive orbit. 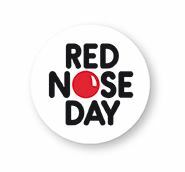 Loved your memories about CherryAde and your stunning cake is perfect for Red Nose Day! Thanks for adding the link to our BundtaMonth linky tool!